This patch will provide compatibility for all for the Visual Studio 2008 products that connect to Team Foundation Server 11/Team Foundation Server 2012. 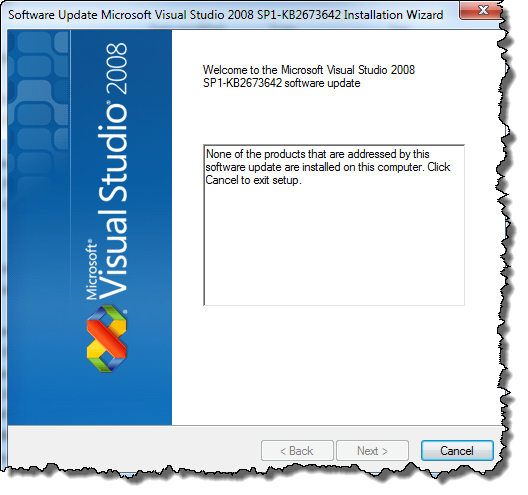 Before you apply this patch you must ensure you’ve already applied Visual Studio 2008 SP1, and of course you must also have Team Explorer 2008 installed or this patch does not apply to you. The forward compatibility update for Visual Studio 2008 SP1 Team Foundation Server 2010 is also available. Have you tried this? Did it work for you? I cant open source control or some work item queries. Yes I have used it. I will see if I can get the compatibility matrix. Here is the compatibility matrix. Sorry I did not, I’ll dig up my VS 2008 VM and take a look. Finally, I figured out what happened. For some reason, the TFS client cache tricked TE 2008… It was still pointing to the TFS 2008 server instead of the TFS 2012 server. It appears that the target branches are not sorted the same way, depending to which server you’re connected. After resetting the cache, the client correctly connects with TFS 2012 and target branches are sorted as expected.